George Edwards, an ex-folk troubadour who had cut a solo 45 for Dunwich, Norwegian Wood/Never Mind, I'm Freezing, and a raw cover of Bob Dylan's Quit Your Low Down Ways, that remained unreleased until its inclusion on Happy Tiger's Early Chicago compilation in 1971, was working as in-house session vocalist with Dunwich when this Chicago-based outfit was first assembled. Aside from David Michaels, the other three members of the band were borrowed from another Chicago ouffit, The Rovin' Kind. The name H.P. Lovecraft was appropriated from the deceased fantasy horror wrighter. This initial line-up (February 1967) was responsible for the first 45, although the flip side was a George Edwards solo outtake from the previous year. The group came together as a stable entity in the Spring of 1967 (line-up B), although Tom Skidmore soon made way for Jerry McGeorge, who'd previously played with The Shadows Of Knight and Dalek/Engham: The Blackstones. (Joe Kelly, also of The Shadows Of Knight, was briefly in the band when Tony Cavallari, was absent for a while in late 1967). The vocal combination of the folkie Edwards and Michaels, a classically-trained singer, gave the band a unique and distinctive vocal sound effectively supplemented by Michael's powerful keyboard-playing. Their debut album is one of great variety. The stand-out track was The White Ship and this is the song with which the group are most usually associated. Making use of a 1811 ship's bell, sombre harmonies, reeds, feedback and some baroque harpsichord pieces it conjured up a hallucinogenic atmosphere ideally suited to the times. Also of note were an excellent upbeat version of Dino Valente's hippie anthem Let's Get Together, which preceded The Youngblood's hit by over a year; That's The Bag l'm In, which had its roots in the garage; Wayfaring Stranger, a folk-based number and the dopey, sleepy number, I've Been Wrong Before, which gave a clear indication of the direction they would follow on their second album. In the Spring of 1968 they relocated to Marin Country in Northern California, having already briefly toured the West Coast. They became a frequent attraction at the nearby San Francisco ballrooms playing alongside most of the top Bay Area bands. Jerry McGeorge wanted to stay in Chicago and was replaced by Jeff Boyan, previously with Hezekiah and before that Saturday's Children. Not only was Boyan a talented guitarist, he possessed a distinctive lead voice, too. Later that year the group moved on again to Los Angeles where they recorded a second album which contained many fine moments. The sleepiness of the tracks like Spin, Spin, Spin, Electrallentando and Mobius Trip was reminiscent of the second side of the first It's A Beautiful Day album. There was a fine version of High Flying Bird, a song recorded by many West Coast groups; At The Mountains Of Madness, which captured the group's vocal harmonies at their tinest, and Blue Jack Of Diamonds, which had an unusual chiming intro. This is reputedly the first major label album where all those involved in the recording were high on acid! H.P. Lovecraft effectively dissolved in 1969. Their first 45 got a further airing on the Early Chicago compilation a couple of years later. A new line-up of Edwards, Tegza, Marty Grebb (ex-Buckinghams and Exceptions), Michael Been (ex-Troys) and Jim Dolinger (ex-Aorta and Exceptions) signed with Reprise in 1970 calling themselves Lovecraft. 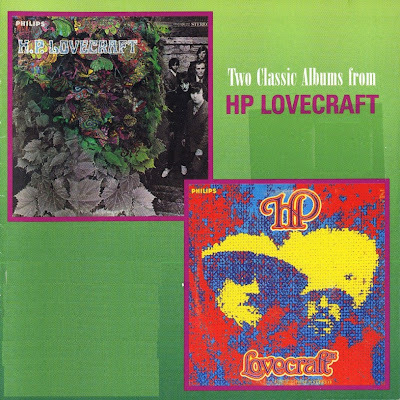 Edwards departed before they recorded a rockier album and 45 the following year and soon Lovecraft were no more. Tegza later joined Bangor Flying Circus, but he reformed Lovecraft with an entirely new line-up in 1975 and a disappointing further album and two 45s were released which attracted little attention. Thanks for 2 in 1. From the name of the band, I always thought this band would be dark, gothic, probably cheesy psychedelia/hard rock. Just started getting familiar with these records recently and boy was I wrong! This has got to be some of the most well-performed, best-arranged, well-recorded and emotionally powerful psychedelia ever. Really amazing, distinctive keyboardist. Really overlooked compared to their worth! Great stuff, totally recommend it.